This scene is built around the iconic Mies van der Rohe daybed. It is such a fantastic piece. As photographed, the scene looked "sleepy" to me, kind of dreamy. I played with the lighting a bit to try to evoke different moods. I also used the plant in the foreground in some cases, and in others, not. I couldn't decide if it worked or not. Photographing this scene reminded me of the many hours spent wallpapering this space. I think the paper has held up so well, which makes me not regret all that measuring, cutting, and gluing! I don't recall where or when I got the bee artwork. It is a heavy plastic -- perhaps it was part of a belt or some jewelry. The other shield-like piece is also a random find -- not sure where I got it or how it was originally used. AG Minis; long plant is TOMY; stools are Paris Renfroe. ; arc lamp is an eBay find. Accessories are Dragondee, Oese, and doll show finds. It's been a long time! I have had a ton of distractions that have prevented me from blogging, but mostly all productive. I have missed communicating with my readers and the larger "mini" community, but the time provided me with some clarity about my collection and its organization -- it's difficult to create scenes and work with your houses when things are in complete disarray. One huge obstacle was flooding in our basement, which is where my collection lives. Our hot water heater decided to break and we had a real mess on our hands. Luckily, very little of my collection was affected, but it did impact the entire basement space. So, we've been spending the past few months on cleaning, mold remediation, painting, and reorganizing. This work forced me to *really* look at my collection and how I was maintaining the houses and accessories. This process has provided a nice opportunity to reconnect with my collection, too. While my work continues, I managed to set up a quick scene in the Loft to Love house from Target. See those stairs? I made some carpeting from remnants of FLOR tiles that my husband used in his home office. They work pretty well! Credits: Chair is Reac; table is by MitchyMoo; wall shelving is by Dragondee; rug is a dollhouse plant is by AG Minis and it is in a napkin holder from the Crate & Barrel outlet. ; wallpaper is from Paper Source. Accessories are Re-ment, Dragondee, Manor House Miniatures, Paris Renfroe, AG Minis. I'm lucky to have a small and manageable dollhouse show to go to right by my house: the Hightstown Miniature Show, now in its 37th year. This is my fourth year going--I've written about my visits before--and I've now honed my system for visiting and buying. First: SHOW UP LATE. I arrived with only 90 minutes left for the show and it was not crowded and I found a lot of things. Also, most sellers were offering 1/2 off everything since it was toward the end. Second: MODERN IS NOT MAINSTREAM. No one is really collecting modern, so you can find some cool styles, usually discounted. This makes the first tip even more relevant, since early birds will be hunting down Victorian quarter scale and not midcentury. Third: ALWAYS DO AN EXTRA LOOP AROUND, EVEN IF YOU THINK YOU'VE SEEN EVERYTHING. You haven't seen it all, trust me. I always find things in places I thought I had looked. You just overlooked them! Fourth: HAVE PATIENCE WITH THE DOLLAR BINS. While it might all look broken and/or dusty, you can find some gems in the plentiful dollar bins -- most sellers have some version of them. So, all in all, it was a productive and happy experience. I do like "getting lost" in all the stuff, and there was a lot of it. These cool retro outdoor chairs, also pictured at the top of the post, were sold by this woman who had used them in her original dollhouse growing up in the 1960s. They are metal with plastic tubing, just like the real chairs! The pillow was from a different seller. This table and chairs were also from the same seller who had them in her house. I am wondering if they are by KAGE or Strombecker....any ideas? Did you see this paper? I am hoping this might work as exterior stonework for my Contemporary House by Doll Domiciles. I hope to have an update on it soon. A comfy dog bed -- did not have one of these. Nice green rug, too. I got a very nice wooden dining table that needs a leg fixed. Curious about the price tag for all this stuff? Less than $30! Hope you enjoyed seeing my finds. I feel like I am on a roll with sharing some new modern dollhouses (I just profiled the new "Loft to Love" house here), so I wanted to send another one your way. Welcome, Cubic House by Djeco! I've read that the house was inspired by classic architecture, and I can see a strong resemblance to the De Stijl ("the style") movement, which developed in Amsterdam in the early part of the 20th century. 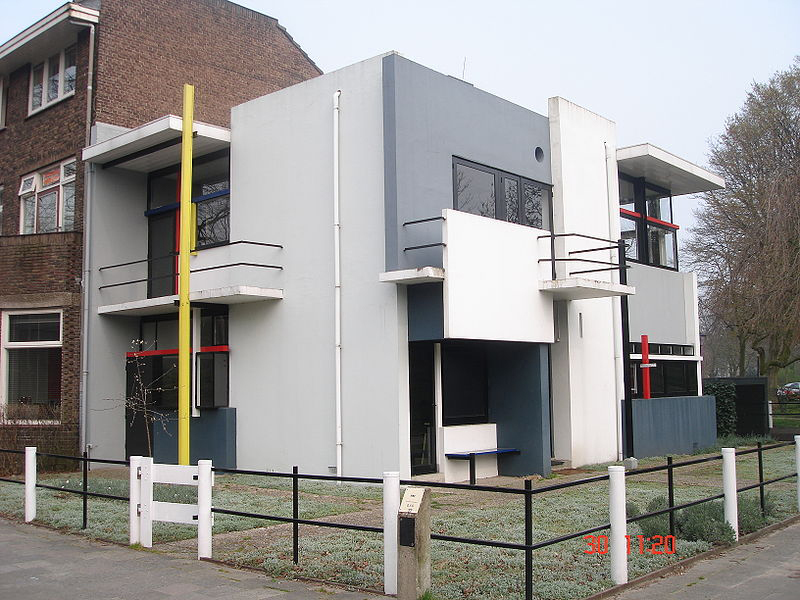 A famous example is the Rietveld Schroeder house, built in 1924. Back to the dollhouse: you may have seen my post last year regarding a few Cubic House furniture sets. The house, which is closest to 1:16 scale, requires some assembly, so I had not yet opened the box. I decided to break the plastic wrapping on the box last week and got to work. My son expressed interest, so I enlisted him to help! The assembly was pretty straightforward, although I'd recommend two people, since there are a number of tiny screws and it helps to have an extra pair of hands to hold things steady. The component parts are made of a smooth, sturdy wood. Many of the walls are painted in vibrant colors, but the floors are uniform in the natural wood color, which is nice. There are some clever features, such as a "bookshelf," which is beneath a wall of windows, and a transparent roof. I cleaned off my desk by the window in our living room to utilize natural light, and started placing some furniture in the house. The decorating took place over the past week; I would do "drive-bys" and drop in a rug here, a chair there, until it all came together. Overall, the construction and materials are of a very high quality. I'd say that the layout is a bit limited, but you could definitely improvise with different setups and wall and floor coverings. And, of course, there are no stairwells or doors, so you definitely have to use your imagination. Keep in mind that the starting age for the house is *four*, so we adults need to keep our demands in check! You can find the house online, via some European stores and eBay. I actually purchased mine from a store all the way in Australia, Milk Tooth. Hope you enjoyed this look at the house--do share if you have one too! Credits: Bottom Floor: Dining table and chairs are custom pieces by Patie of Minisx2 on Etsy; couch is a vintage artisan piece that I bought in Denver; rug and globe lamp are minimodernistas; stool is vintage Brio; long planter is vintage TOMY; topiary is AG Minis; patio chairs and checkered floor tiles are Megahouse; fireplace is vintage Lundby; circular rug is a placemat from CB2. Top Floor: Desk and chair are vintage Brio; cork board is a custom piece by The Shopping Sherpa; Barcelona chair is Reac; side table is Re-ment; rug is Lundby; shelving unit is ELF Miniatures; plant is an eBay find. Accessories throughout are: Re-ment, eBay, dollhouse store finds, and Lundby. The house is part of the "Lori" line of 6 inch dolls, so it is scaled for 1:12. I've actually had the Loft for a few months now, having bought it on impulse from Target; somehow, a trip for deodorant ended with a dollhouse and a boxed set of desk furniture! The house cost $49.99, and the furniture was $14.99. You can see Modern Mini Houses's post on the house, which includes links to other reviews. As she notes, the house is being sold on eBay for double the retail price, so I'd recommend snatching it up from Target if you are interested in adding this to your collection. The layout of the house is very open and simple. It comes with the stairs already built-in, along with a kitchen set and island, which has two chairs. The kitchen area also has built-in ceiling lights, which are plastic and bright yellow. All the kitchen furnishings are plastic, as are the stairs. The rest of the structure is heavy pressed wood, including the interior flooring and walls. The roof is covered in a green felt, and the exterior walls stylishly mimics concrete and wood. The floor-to-ceiling windows are quite nice and impart a very modern vibe. Overall, the house is well-made, although the plastic imparts a cheaper and less realistic look to the kitchen set. I ended up using the set and island, but used different chairs. For the upstairs, I did use the new desk set, but minus the yellow chair and some of the accessories like the globe and bulky computer. The set comes with a piece of chalk as the black area is chalk-ready -- clever! I used a Lundby light for the stairwell, which worked well. You can capture some dramatic angles -- not bad for a house marketed at 3 year olds! So...did I need another house? No. Am I glad I bought it? Yes. It's sturdy and has options for versatility; there is a lot that could be done to give the stairs, floors, and walls a different look. And the price was right! Credits: Kitchen: chairs are Bozart; plant is TOMY; rug in kitchen is from the Paper Source; cork rug by front door is from a Con-Tact roll of adhesive cork paper; hanging light is Lundby. Upstairs: desk set is Lori Loft to Love; chair is Reac; couch is Brio; stool is vintage German; rug is paper from the Paper Source. Accessories: Bandai, Re-ment, miniatures.com, Dragondee, LiLu Shop on Etsy, Shopping Sherpa, and eBay. Minor victory: I added the terrace to my Citadel house, which has been a long time coming! The Citadel was one of the first houses I purchased, and somewhat impulsively. Back in 2009, it came up on eBay as a Buy it Now, pickup only in Chicago, IL. I live in NJ, but rationalized that I had family there, so why not? As it turns out, our family did not have to do anything, since we took a road trip with our three kids and went to pick it up! You can read about our adventure here. Since then, the Citadel has brought me great joy. It's been the setting for both of my book cover projects, and the editorial work I did for Ladies' Home Journal. I've spent lots of hours wallpapering and restoring one side of the house; I still have the other side to tackle, as well as the central stairwell, which is supposed to be enclosed in plexi. Credits: Chairs are CB2 ornaments; pillows are minimodernistas; topiary is AG Minis; other plant is TOMY; table is vintage Petite Princess; glasses are vintage German. In the living area, the couch and rug are minimodernistas; table and shelving unit are by Patie of MinisX2 on Etsy. Accessories are AG Minis, Re-ment, miniatures.com, Michaels, eBay finds, and dollhouse show purchases.